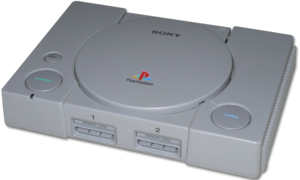 The PlayStation refers to the original Sony PlayStation console (commonly known as the PS1, PSOne or PSX) first launched in 1994/1995. The console is a fifth generation, CD-ROM-based machine capable of supporting 32-bit gaming, and was the most popular gaming consoles during the late-1990s. The console began shipping with the DualShock digital/analog controller in 1997 (replacing the original PlayStation control pad), and in 2000, a compact version of the console, the PSOne, was released. The PlayStation is the earliest gaming console to include Grand Theft Auto games, mainly the pre-Grand Theft Auto III top-down installments, as the game is fairly capable of rendering 3D graphics. However, whilst the PlayStation's release of Grand Theft Auto 1 and Grand Theft Auto: London, 1969 are nearly identical in gameplay and graphics with the PC versions, the PlayStation version of Grand Theft Auto 2 lack several features present in both the PC and Dreamcast versions of the game, such as nighttime lighting and trains, due to hardware limitations. Following the release of the PlayStation, five succeeding consoles were released in the following years, including the PlayStation 2 (PS2), PlayStation Portable (PSP), the PlayStation 3 (PS3), PlayStation Vita (PSV), and the PlayStation 4 (PS4), which multiple succeeding GTA games have been release for. In December 2018, Sony released the PlayStation Classic, a dedicated console containing 20 built in games; in the North American and European versions, GTA 1 is included. PlayStation 1 logo, now used on every PlayStation product. This page was last modified on 23 December 2018, at 19:49.